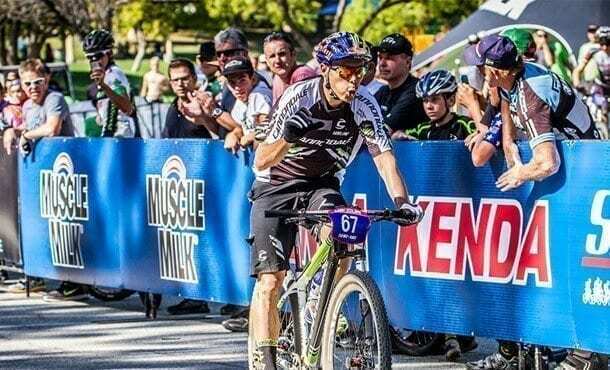 Marco Fontana (Cannondale Factory Racing) and Katerina Nash (Luna Pro Team) won the short track mountain bike race held at Bonelli Park in San Dimas, California on Sunday afternoon. Fontana beat Stephen Ettinger (BMC Racing) and Raphael Gagne (Rocky Mountain Factory Racing) in the elite men’s race while Nash finished ahead of Emily Batty (Trek Factory Racing) and Catharine Pendrel (Luna Pro Team) in the elite women’s contest. Making it the perfect weekend, Katerina Nash (Luna Pro Team) backed up her Bonelli Park cross country win on Saturday with a short track victory on Sunday. Added to her Mellow Johnny’s cross country victory of two weeks ago, Nash – who is from the Czech Republic but lives in California – is undefeated so far this season. The elite women lined up at the start for what would be a fast and exciting race around a short, spectator-friendly course. For the first three laps of the race, the 27-women strong field stayed mostly together, but was strung out by the fastest racers riding a blistering pace at the front. Nash sat comfortably in the peloton while Canadian Cindy Montambault (CVM 2 Vals) set the pace early on. Near the end of the fourth lap, another Canadian Catharine Pendrel played the first card for the Luna Pro Team, taking a flier. Emily Batty (Trek Factory Racing), also of Canada, reacted to close the gap and was followed closely by Nash and Gould. As Pendrel applied pressure at the front, stragglers continued to get shed off the back. Two laps later, the Luna Pro Team riders were still comfortably in control, driving the pace of what was then a 12-woman lead group. By the end of lap seven, it was Luna’s Gould, Pendrel and Nash in the lead along with Mary McConneloug (Kenda/Stan’s NoTubes) and Batty. With a quarter of the race left to go, the pace eased, allowing a regrouping of eight women who stayed together until they got the two-laps-to-go signal. Going into the last lap, Nash led Batty, Pendrel, Gould and McConneloug. They maintained their positions and finished in that order. Pendrel was awarded a $200 prize as the race’s most aggressive rider. Italian Marco Aurelio Fontana (Cannondale Factory Racing) proved that short track racing is not just for North Americans when he won the elite men’s race, which drew 69 men to the start line. The men set out to race 20 minutes plus two laps. Another European Sergio Mantecon Gutierrez (Trek Factory Racing) of Spain took the hole shot ahead of US Cross Country National Champion Stephen Ettinger (BMC Racing). The two led a large group as it snaked its way through lap one. Gutierrez continued to set the pace for the first two laps, followed by Fontana and Ettinger. The Spaniard rode so strongly that he created a gap on his rivals early on lap 2. Canadian Max Plaxton (Cannondale Factory Racing) first led the chase, along with Ettinger, Fontana and Todd Wells (Specialized). Their efforts paid off as the leaders were reunited for the third lap, largely thanks to US Short Track National Champion Wells putting the hammer down to close down the last part of the gap. Plaxton unfortunately lost control on on the far side of the course and crashed out of the race. Eight men were then together at the front with a slight gap on a chase group led by Saturday’s cross country winner Geoff Kabush (Scott-3Rox). The Canadian, as he did the previous day, tended to ride his own pace, evening out the surges and ebbs of the other top riders until he eventually caught up with the leaders on lap four. Wells won the Sho-Air hot lap prime of $200 on lap five, crossing the line just ahead of Fontana. A brief respite after the hot lap meant 12 men raced together in the lead group, but at minute 17, Wells launched an attack to break up the group and improve his own chances at a win. Fontana was the first to react to Wells. With one lap to go, Gutierrez came back to the front, leading Fontana, Raphael Gagne (Scott-3Rox) and Manuel Fumic (Cannondale Factory Racing). Only eight men remained in contention for the win, while Europeans Fontana and Fumic proved their condition in an unfamiliar format by never being outside of the top five places for almost the entire race. Fontana took over the lead on the back straight of the final lap with Ettinger and Gagne in tow. The Italian successfully negotiated the tight final corner and held off Ettinger and Gagne in the dash to the finish line. Wells rolled in for fourth place ahead of Gutierrez in fifth. Cross country winner Kabush rode in for sixth. Photo – Marco Aurelio Fontana (Cannondale Factory Racing) wins the elite men’s short track race at Bonelli Park.